Invite bluebirds and other small birds to dine in your garden using the Songbird Essentials Green and Brown Mealworm Feeder. This sturdy, nature-inspired feeder offers an environmentally friendly hint to your bird garden, with its recycled plastic frame and classic color scheme. Its unique design provides bluebirds and other small birds access to a protected feeding haven, with 1.5" diameter entry holes on the brown uprights leading to an open chamber. These entries deter larger birds from reaching the treat, and two Plexiglas panels allow you to watch all the avian activity. Place up to 1.5 quarts of fruit, berries, mealworms, cracked corn, or other feed in this open chamber for your birds to enjoy, and lift one side of the lid for refilling the unit as needed. This green, pitched roof protects the feed from the elements, while a platform on each end of the piece bends upward to provide resting spots for songbirds. The recycled plastic construction prevents rotting, warping, cracking, and peeling, for use season after season, and an attached cable makes it simple to hang in your backyard. This post-consumer plastic creates an environmentally sound item, and its dark green and brown hues add a natural look to the piece. 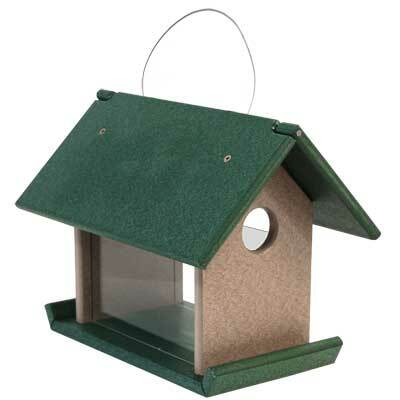 Offer birds new types of food in this Green and Brown Mealworm Feeder. Made in the USA. Lifetime guarantee.